It can be argued that most people don't eat healthy during the holidays, but as it turns out, you can make smarter (and somewhat healthier) choices while still getting a full dose of the sweet and savoury stuff. 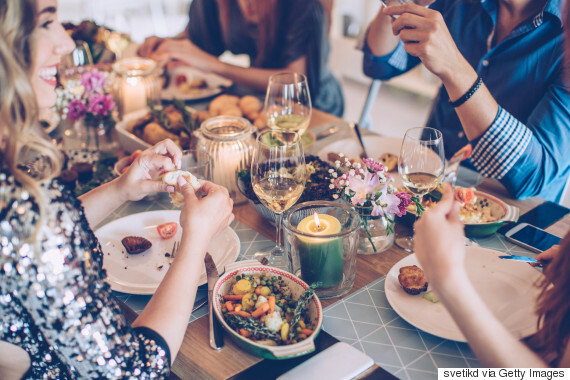 In the video above, registered dietitian Lindsay Jones says one of the best things you can do to eat healthier at a holiday party is filling up your plate with all the healthy food right off the bat. "Aim for half of your plate to be a vegetable, a quarter of your plate a starch or carbohydrate, and a quarter of your plate a lean protein," she says. When it comes to alcohol, editor-in-chief of Men's Health magazine Matt Bean says one way to consume less wine, for example, is drinking out of a smaller glass. "A recent study showed that drinking out of a smaller glass, even if it's the same amount, means you're that much less likely to reach for another drink," he says. Another way to control your indulgences is looking at why you're overeating in the first place. Some studies have shown people tend to overeat during the holidays due to stress and eat less when they feel relaxed.